Most parents have tried chore charts as a means to wrangle cooperation from their kids. I bet, at some point, you may have assembled all those little wooden magnets with cute icons representing chores that you hope your kids will be inspired to do partly because of the cute icons. And then the little round buggers end up on the ground where the dog eats them or the kids eat them or they get all messed up and the kids fight over who put what where and after three days of madness about the mechanics of the chore chart, you give up and return to begging, pleading, bribing and threats. That was my experience, more or less, along with forays into white boards that Velcro onto the refrigerator, hanging wall charts, and good old copy paper with categories hand drawn with magic marker. The result? 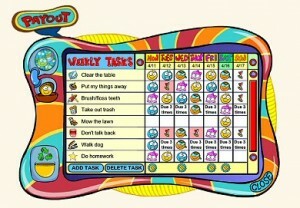 We, okay I, always lost interest in maintaining the chore chart after about three days. And while it typically takes three days to break or start a new habit with kids, the adage doesn’t seem to apply to chore charts. The reason is because chore charts are more about the chart and less about the chores. So, here are the three practices that have worked for our family instead of chore charts. We’ve discovered them by trial and error but each has reaped more rewards than a daily tally of tasks completed. They also straddle personal responsibility chores such as brushing teeth and making beds and broader household chores that elementary school and older children start to take on. My kids don’t like to set the table for dinner. They complain, dawdle, procrastinate and whine while I badger, coax, insist and sometimes end up setting it myself. Clearing the table afterwards follows the same pattern. Eventually, it’s too much hassle to get them to do it. Plus, I’m of the opinion that begging a child to do a chore negates much of the purpose. So after a muddled period where our two kids were basically off the hook while we regrouped on the chore front, we asked our six-year-old daughter to feed the dog. She did it. We asked her to take on the responsibility for feeding him every night. She still does it. Next, we asked our eight-year-old son to take out the trash. He did it. In fact, he takes it downstairs and out to the garbage every day without complaint. Our lesson? The kids feel more ownership and responsibility for certain chores. Perhaps they are simpler or make them feel older or distinct. Whatever the reason, it’s helpful to realize that it may take some work to get a good chore fit for a child. Kids like routines but let’s be honest, it takes work to make them. It takes parental effort to insist on the same activities day after day, regardless of the circumstances. But making routines more routine makes them easier to create and sustain. We do this for morning chores. Every morning, the kids need to go upstairs after breakfast and make their beds and brush their teeth. Every afternoon, they do homework before playing; reading before computer games. When they expect routines, they fight them less. At our elementary school, the classrooms work to fill in honeycombs on a beehive to demonstrate they are being safe, kind, and responsible. I copied the idea for home and made a family challenge chart. The goal was to get the kids to start some good behaviors they were struggling with such as looking adults in the eye to say hello, sharing, reading more, and getting items for themselves instead of asking us to get them. We called it the Levy Family Challenge and drew a big circle on a piece of paper with sections for Kindness, Responsibility, Respect, and Smarts. Each time our kids said an unprompted please or thank you, or said hello politely to an adult, studied hard, and took responsibility for their stuff and their chores; we colored in a segment of the circle. Oh, and we promised a big surprise when the circle was complete. Now, it’s true that we promised something they’d love at the end. But we didn’t tell them what it was and to my surprise, they didn’t beg us to disclose it. We gave them fifteen days – a time box that helps keep kids motivated and moving towards the goal. What transpired was one of our most pleasant weeks ever. It turns out, kids respond to a challenge. They want to get there. They want to fill in the circle. The challenge itself seemed to mean more than the reward. That was part of the lesson; to work hard to complete something for the benefit received when you’re finished. Sometimes, the personal satisfaction and pride at completing a goal rank up there with the reward itself. So I say chuck the chore charts and try a family challenge chart instead. Most of us can’t sustain checking off every little task and chore completed throughout the day. Plus, when the focus is on the task, it seems to require a lot of pleading and cajoling; one reason we probably abandon the chore charts so quickly in the first place. A challenge, on the other hand, allows independence for the timing and selection of tasks and behaviors to achieve the goals. Adding the time box kept things moving and the kids motivated. Okay, I had another reason; I’d booked tickets to Disney World and wanted to make that the big surprise. No, you don’t have to go that crazy; remember the kids didn’t know a surprise as big as Disney World waited at the end. Our next Family Challenge will probably result in dinner at a special restaurant, a weekend of unlimited devices, or maybe dessert first for a few meals. Either way, I’m hoping they still respond more to the challenge than the potential reward.